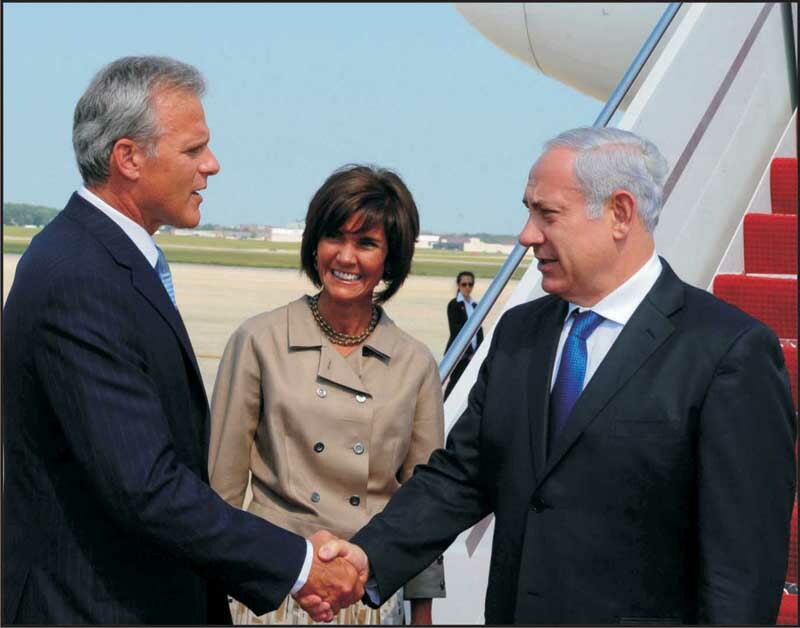 Israeli Prime Minister, Benjamin Netanyahu (right), greeted upon arrival on one of his trips to Washington by Israel�s Ambassador to the United States, Michael Oren. Washington, DC�Michael Oren, Ambassador of Israel to the United States, outlined the �array� and �magnitude� of threats currently facing the State of Israel at the B�nai B�rith policy conference. Calling Iran�s nuclear ambitions �the greatest threat looming over our horizon�of monumental proportions,� Oren outlined the multifaceted nature of the threat. A nuclear-armed Iran would not only have the ability to target any Israeli city, but it could open the door for terrorists and other Middle Eastern nations to access nuclear arms as well. Should Iran develop nuclear weapons, �[it] presents not one, but an assortment of existential threats to the Jewish state,� Oren said. Closer to Israel�s borders, Oren detailed developing concerns with the Sinai Peninsula and Syria. After witnessing an influx of terrorist activity, Israel has taken measures to secure its border with the Sinai and curb missile fire into its southern cities. As the civil war continues to rage in Syria, Oren expressed worry that Syria�s stockpile of chemical and biological weapons could fall into Hezbollah�s possession and be used against Israel. While recognizing the continuing threats facing Israel, Oren expressed optimism regarding the Jewish state�s ability to counter those threats both militarily and diplomatically. In curbing the effectiveness of rocket fire into Israel, he noted the success rate of the iron dome, the first anti-ballistic missile system in military history. Oren also said, �Israel is in a better geopolitical strategic situation today than it has been (before).� He noted Israel�s �excellent relations� with countries such as Poland, the Czech Republic and Bulgaria. He also mentioned Israel�s expanding economic relationships with India, China and the United States. �Today, Israel is a powerhouse,� Oren said in terms of the Jewish state�s technological achievements and economic advancements. Regarding Israel�s relationship with the United States, Oren said the two nations are �intensely close� and �see eye to eye� on most issues. Both the United States and Israel are committed to a two-state solution that guarantees Israel�s security and oppose the unilateral declarations of statehood pursued by the Palestinians at the United Nations. B�nai B�rith International, the Global Voice of the Jewish Community, is the oldest and most widely known Jewish humanitarian, human rights and advocacy organization.